For more information about Euro Plumbing LLC and the plumbing services we provide in the Highlands Ranch area, contact us today at (303) 668-6844 for a free, no-obligation quote. We are happy to answer your questions and provide more details. Replacing kitchen sink and faucet is a quick way to give your kitchen a new look, but there are potential plumbing problems to watch out for. To avoid all this problems happen to you contact us today for friendly, fast, dependable service. We provide top-notch work with a high level of customer service that will exceed your expectations. Customer’s satisfaction is our highest priority. 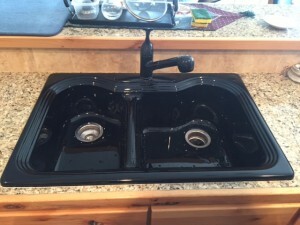 Your kitchen deserve the right sink and your sink deserve the right plumber!! !Enjoy the new sink today! Call us today!! !